I'm sure that many of you are feeling this way right now as well, but I think it has to be said: I need a detox. After a long weekend filled with takeout, turkey, and several glasses of wine and slices of pumpkin pie I am feeling pretty sluggish jumping back into real life again. 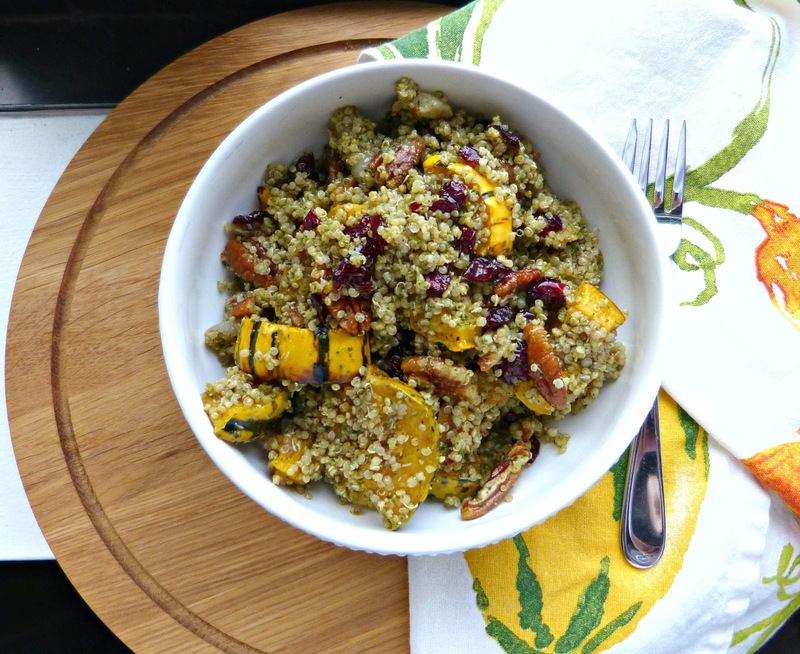 My body is crying out for something healthier this week and this squash and quinoa recipe is just the answer! This squash and quinoa dish is simple to assemble and is full of seasonal flavor. I like to pack it for lunch as a filling vegetarian main dish. It would also work nicely as a side dish for roasted chicken or pork. It's also incredibly versatile. 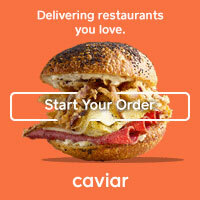 As far as ingredients go, the star of the show is roasted squash. You'll need two small ones, but any variety you like will work-- I actually used one sweet dumpling and one delicata squash, both of which I had recently picked up at the farmer's market. However, acorn would work nicely, or even a small butternut squash too. 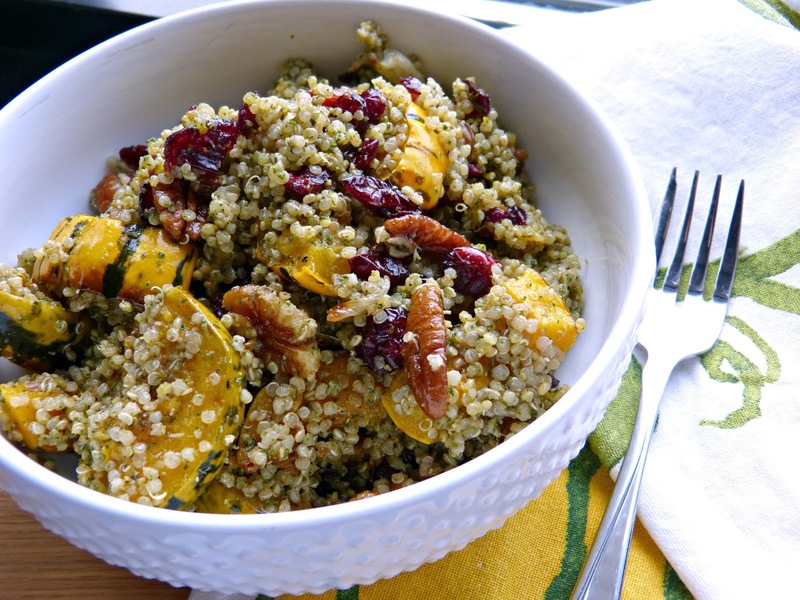 The squash is paired with sweet roasted onions, cooked quinoa, dried cranberries, and toasted nuts. I prefer pecans or walnuts here, but you could also try this with almonds too. To bring it all together, I toss the mixture in a combo of a little vinegar and homemade sage pesto. You may not have sage pesto on hand, but I'd highly recommend whipping up a batch-- especially if you're like me and wondering what to do with all of the leftover fresh herbs you grew before the winter freeze sets in. You can make a big batch, portion it up, and freeze it to pull out for recipes like this one (or this one)! If you don't have sage pesto on hand, you could also sub in a few Tablespoons of chopped fresh herbs (sage, thyme, parsley, rosemary or any combination of these would be great), a few Tablespoons of olive oil, a sprinkling of grated Parmesan or Romano cheese, and salt and pepper. Cut the squash into 1-inch pieces and toss in a large bowl with onion, thyme leaves, olive oil, salt and pepper. Spread mixture out on a large rimmed baking sheet and roast for 25-30 minutes or until squash is fork tender. In another large bowl, whisk together sage pesto and vinegar until combined. Add squash and onion mixture (along with any liquid from the roasting pan), quinoa, cranberries, and nuts. Stir to combine. Season with additional salt and pepper as needed. keep sharing more such kind of interesting articles. Thanks again.